All Web addresses mentioned were functional as of 5-6-16. From the Cumberland Gap to the Atlantic Ocean, this is Virginia Water Radio for the week of May 9, 2016. That’s a U.S. Fish and Wildlife Service recording of shorebirds. The broad term “shorebirds” refers to a large, diverse group of wading and swimming birds, including seven different bird families in North America. One of those is the family of sandpipers, with about 50 species observed within North America and about 30 species observed within Virginia. Sandpipers breed typically in areas north of Virginia, but many species are winter residents along Virginia’s coastlines or can be seen migrating through parts of the Commonwealth. Besides many species actually called sandpipers, the family includes groups with a variety of other common names, including curlews, godwits, phalaropes, and turnstones. Although many sandpipers are coastal shorebirds, some in the family spend time around inland waters. Small sandpipers are often called “peeps,” and both that name and the “piper” name fit the kinds of sounds many sandpipers make. Have a listen for about 25 seconds to a sample; you’ll hear a Sanderling, Dunlin, Least Sandpiper, Ruddy Turnstone, and Short-billed Dowitcher, courtesy of Lang Elliott and the Stokes Field Guide to Bird Songs. Finally, a notable visual feature of various sandpiper species is breeding feathers colored with some combination of red and brown—one might say “rusty”—such as in the Dunlin, Ruddy Turnstone, Red Knot, and Red Phalarope. The sounds of shorebirds were taken from the U.S. 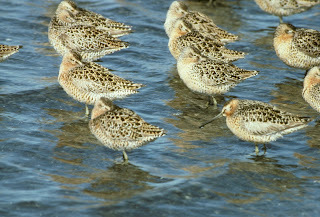 Fish and Wildlife National Digital Library, online http://digitalmedia.fws.gov/cdm/ (“Shorebirds Close” audio clip, online at http://digitalmedia.fws.gov/cdm/singleitem/collection/audio/id/66/rec/68). The sounds of Sanderling, Dunlin, Least Sandpiper, Ruddy Turnstone, Short-billed Dowitcher were taken from the Stokes Field Guide to Bird Songs-Eastern Region CD set, by Lang Elliott with Donald and Lillian Stokes (Time Warner Audio Books, copyright 1997), used with permission of Lang Elliott, whose work is available online at the “Music of Nature” Web site, http://www.musicofnature.org/. “Flying Cloud Reel/Rusty Piper,” by No Strings Attached, is from the 1999 album “In the Vinyl Tradition—Volume I,” from Enessay Music, used with permission. More information about No Strings Attached is available online at http://www.enessay.com/. Thanks to Shannon Ritter of the Virginia Tech Department of Fish and Wildlife Conservation, and to Randy Marchany of No Strings Attached, for their help with this episode. Solitary Sandpiper (front) and Spotted Sandpiper (back) along the New River in Radford, Va., April 29, 2015. Photo by Robert Abraham of Christiansburg, Va., used with permission. Flock of Short-billed Dowitchers in Alaska. Photo by Dave Menke, made available for public use by the U.S. Fish and Wildlife Service's National Digital Library, online at http://digitalmedia.fws.gov, accessed 5-6-16. Direct link for photograph: http://digitalmedia.fws.gov/cdm/singleitem/collection/natdiglib/id/1552/rec/6. Scientists group sandpipers in the taxonomic family Scolopacidae, which includes birds with the common names of sandpipers, curlews, dowitchers, phalaropes, woodcock, snipe, and others. 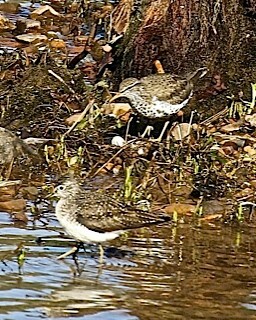 The Virginia Department of Game and Inland Fisheries “Fish and Wildlife Information Service/Species Information” Web site, online at http://vafwis.org/fwis/?Menu=Home, lists the following species in the sandpiper family (Scolopacidae) as having been observed in Virginia (some only as transients and some only occasionally). Audubon Society and BirdNote®, “Chorus Line in the Sky—Learn how Dunlins avoid in-flight collisions,” Oct. 22, 2014, online at http://www.audubon.org/news/chorus-line-sky. Ken Duckert, “Flying Cloud of Sandpipers” photo, Apr. 16, 2010, online at http://www.pbase.com/ken_duckert/image/123930877. Russ Kerr, Newport Bay [California] Conservancy Web site, http://newportbay.org/wildlife/birds/migration/. Chandler S. Robbins et al., A Guide to Field Identification of Birds of North America, St. Martin’s Press, New York, N.Y. (2001). Bob Sundstrom, “Singing Sandpipers,” BirdNote®, 5/4/16, online at http://birdnote.org/show/singing-sandpipers. Virginia Department of Game and Inland Fisheries, “Fish and Wildlife Information Service/Species Information,” online at http://vafwis.org/fwis/?Menu=Home. Cornell University Lab of Ornithology and the Audubon Society, E-bird Web site at http://ebird.org/content/ebird/. Here you can find locations of species observations made by contributors, and you can sign up to contribute your own observations. Virginia Society of Ornithology: online at www.virginiabirds.net. The Society is non-profit organization dedicated to the study, conservation, and enjoyment of birds in the Commonwealth. Xeno-canto Foundation Web site at http://www.xeno-canto.org/. The site provides bird songs from around the world. All Water Radio episodes are listed by category at the Index link above (http://www.virginiawaterradio.org/p/index.html); see particularly the “Birds” subject category. For a previous episode on other sandpiper species (Solitary Sandpiper and Spotted Sandpiper), see Episode 264, 5/4/15. For a previous episode on another kind of small shorebird (Piping Plover), see Episode 79, 9/12/11. 1.5 - animals’ basic needs and distinguishing characteristics. LS. 4 - organisms’ classification based on features.